The global Apiculture market is estimated to be worth $8,819 million and is anticipated to further grow at a CAGR of 2.6%. The North America apiculture market generated $1,043.4 million in revenues in 2017. 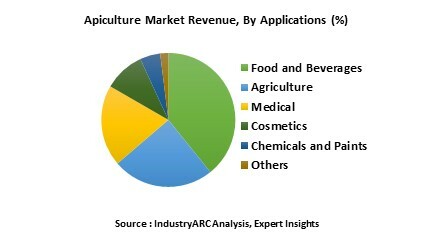 Increasing inclination towards healthy food, growing demand for sustainable living and environmental issues are the factors favoring the market growth. However, protection of bees and maintenance of their health are the restraining factors for Apiculture market. Based on products, live bees segment is likely to acquire the highest market share due to their importance in pollination in the agricultural fields. Apiculture means ‘honey gatherer’. It plays an important role in the agriculture and are responsible for more than 30% of the world’s food supply by providing pollination in about 100 flowering plant species. Apiculture includes maintenance of bee colonies for the collection of different products like honey, beeswax, propolis, flower pollen, bee pollen and royal jelly. These have satisfying number of applications in various industries and are constantly increasing in number due to the surging awareness on benefits of these products. What are the major applications for Apiculture? The various end users assessed includes Food & Beverages, Agriculture, Military, Medicine, and Cosmetic, Paints and Chemical and others. Propolis, which consists of a range of plant resins collected by the bees and used to seal holes in the hive, has been used for a variety of purposes. It is now known to have a diverse range of pharmacological properties, including anti-inflammatory, anti-oxidant, anti-bacterial, anti-fungal, anti tumour and some anti-viral properties. Royal Jelly is widely used as a food supplement, and whilst there is some evidence that Royal Jelly may have some cholesterol-lowering, anti-inflammatory, wound-healing, and antibiotic effects. Indoor Beekeeping: Bees access the outside via a tube while the hive body and colony live inside a hexagonal compartment-mounted inside. The modular compartments are able to connect to each other making the hive expandable to any size necessary to accommodate the colony. Most models shipped with an established colony and infrared lights to enable viewing at night without disrupting the bees’ normal circadian cycle. Hex Hive: The Hex Hive is another innovations aimed at providing a man-made hive that’s closer to what bees find and use in nature. The shape and size resembles a tree trunk and use foundationless frames. They look a bit like hexagonal Langstroth hives, but are raised off the ground so that the entrances in each of the “supers” are at the height bees find optimal. SolutionBee: SoultionBee uses physical sensors to track with your hive. It’s able to collect and store data such as weight and temperature on a preset schedule. SoultionBee then sends this data to generate reports and aide the beekeeper in tracking progress. In addition, this system will sound an alarm if it’s unable to weight the hive. Beetight: Beetight is a free app for beekeepers. It’s capable of interfacing with all hive types and enables the beekeeper to view hive details at a glance. Beetight provides a place for beekeepers to quickly record information about inspections, treatments, feeding, harvest, and bee temperament. Hive Tracks: Hive Tracks amalgamated with Google maps and grants the beekeeper to keep a pin where each hive is located. From there, the beekeeper is able to develop the hive to look like the hive in the yard. The original value of the software is in logging inspection dates and notes, tracking harvests and other important data. The companies referred to in the market research report includes Betterbee, Bartnik, Beehive Botanicals, Seldom Fools Apiculture, Miller’s Honey Company, Shandong Bokang Apiculture, Dabur India Limited, Arnold Honeybee, Chengdu Feng’s Apiculture, EURL Atlantic Apiculture, Thomas Apiculture and more 20 other companies.